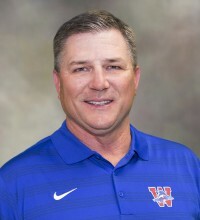 Coach Todd Dodge is the Head Coach and Athletic Director at Austin Westlake High School in the Eanes Independent School District. In his 5 years running the Chaps program he has amassed a 59-10 record including 3 Regional Championships and 1 State Runner up. His two starting Quarterbacks, Sam Ehlinger and Taylor Anderson are now ranked 1 and 2 in Career Passing as well as Touchdown Passes and Total Offense. The quarterbacks ranked just below Ehlinger and Anderson on the Westlake Career list are both Super Bowl MVP’s, Nick Foles and Drew Brees, respectively. Ehlinger, who is currently the starting QB at The University of Texas, was named the Associated Press Sports Editor (APSE) Class 6A 2015 Offensive Player of the Year. That 2015 state title appearance was Coach Dodge’s 6th as a head coach and he was named Coach of the Year by USAToday High School Sports that year. Over his 30 year coaching career, where Coach Dodge has been an innovator of the spread offense in the state of Texas, he has coached seven State Offensive Players of the Year. Sam Ehlinger - 6A, Chase Wasson, Chase Daniel (2 time recipient), Greg McElroy and Riley Dodge (2 time recipient) - 5A and Ricky Lay and Max Knake - 4A. Chase Daniel (University of Missouri) a Heisman Trophy finalist, plays for the Chicago Bears in the NFL. Greg McElroy (University of Alabama) led his team to a 14-0 season and a BCS National Title in 2009. He played in the NFL for the New York Jets and Cincinnati Bengals. He is currently a color commentator on ABC/ESPN’s college football broadcast. Riley Dodge (University of North Texas and McNeese State University) received the award as both a junior and a senior and is now Head Football Coach at Southlake Carroll High School. While at Southlake Carroll, 2000-2006, Coach Dodge earned a 98-11 record. He won 4 State Championships in 5 years and was the first in Texas HS history to move up in classification and win the state championship. During this time span the Dragons went a stunning 79-1 with the only loss coming in the 2003 state title game, by a single point. Coach Dodge was a University of Texas Quarterback, 1982-1985, throwing for 2,791 yards and 18 touchdowns. He is married to Elizabeth Neptune Dodge. Their son Riley is married to Alexis Havens Dodge and they are the proud parents of Tate Riley and Landry Mac. Their daughter Molly graduated from Texas State University and is married to Weston Kuenstler. © 2019 Todd Dodge Football Camp. All Rights Reserved.